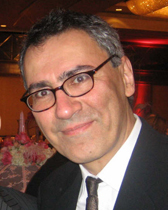 Professor Zadeh attended SUNY at Stony Brook for his undergraduate studies in Physics, then attended Columbia University for his PhD in Astronomy. He spent two years at NASA's Goddard Space Flight Center working as a National Research Council postdoctoral fellow before joining the faculty of the Department of Physics and Astronomy at Northwestern University in 1988. Farhad's main interest is to understand the physical processes that take place in the nucleus of our galaxy, the nature of supernova remnants interacting with molecular clouds, and star formation occurring in HII regions. The observation, analysis, and interpretation of the data is taken with radio telescopes and to a lesser extent with infrared, X-ray and optical telescopes. The nucleus of our Galaxy is considered to be rich and complex in its phenomenology. The activities occurring there are the extreme ends of activities found in nuclei of active galaxies and the disk of the Galaxy. I have worked on many different aspects of the unique sources such as the massive black hole Sgr A* at the dynamical center of the Galaxy. Recently, I have concentrated on the X-ray study of the colliding winds in massive stellar clusters, the origin of X-ray gas in the nucleus of the Galaxy as well as the origin of magnetized radio filaments found within the inner few hundred light years of the Galaxy. The 1720-MHz transition of OH molecule has recently been recognized as the source of an important class of masers (i.e., microwave lasers), the so-called "Supernova Masers". These masers are produced when the expanding supernova remnants interact with molecular clouds. The interaction drives a shock wave into the molecular cloud, compressing and heating the gas, which cools by emitting in a variety of molecular and atomic transitions at infrared and millimeter wavelengths. Molecular condensations associated with protostellar sources are found within evolved HII regions. This suggests that a new generation of massive star formation has been induced by the expansion of the HII regions. My interest is to study the region where the radiation field from bright stars and the protostellar jets interact with each other. A collaboration between Farhad Zadeh and Pamela Bannos, who is a photographer and who teaches at NU, resulted in an exhibition at the Block Gallery. The IT department developed a website in collaboration with us. To learn more about astronomical images visit http://spaceimages.northwestern.edu. I have embarked on an outreach program of public lectures that has featured diverse and interesting topics with broad appeal to students and the public. These public lectures are videotaped and can be viewed on NU's department of Physics and Astronomy website here. "Copenhagen and the German Atomic Bomb Project: Bending Perception to Wish"
"What's Your Sign? Astrology, Astronomy, and Pseudoscience"
"The History of Physics: Paul Dirac -- A Beautiful Mind in the 20th Century"
"Ruby Payne-Scott (1912-1981): The First Woman Radio Astronomer"
"The Birth and Death of Stars"
"Tsunami: The Ultimate Sea Waves, Long-range Vectors of Death and Destruction"
"The Changing Face of Mars"
"Asteroids: Their History, their Impact on Earth and their Complex Geology"
J. W. Hewitt, F. Yusef-Zadeh, M. Wardle M, et al. F. Yusef-Zadeh, D. Roberts, M. Wardle, et al. M. P. Muno, C. Law, J. S. Clark, et al. F. Yusef-Zadeh, H. Bushouse, C. D. Dowell, et al. A. Eckart, F. K. Baganoff, R. Schodel, et al. G. Belanger, A. Goldwurm, M. Renaud, et al. S. D. Hyman, J. W. Lazio, N. E. Kassim, et al.